includes case studies on Indian migrants in the Gulf region — in particular, Bahrain, Oman and Saudi Arabia — and the United Kingdom, among others. With essays by major contributors, the volume will interest scholars and researchers on economics, development studies, migration and diaspora studies, and sociology. It will also be useful to policy-makers and government institutions working in the area. Preface. Foreword Oommen Chandy. Acknowledgements.1. Diaspora and Development: Critical Issues Dilip Ratha and Sonia Plaza 2. Diaspora and Development: Case Study of the Indo-EU Diaspora Alwyn Didar Singh 3. Diaspora and Development: Theoretical Perspectives Amba Pande 4. Diaspora, Transnationalism and Development Ajaya Kumar Sahoo 5. Engaging the Indian Diaspora for Development Smita Tiwari 6. Professional Diaspora Networks and Philanthropy in the Healthcare Sector T. L. S. Bhaskar 7. 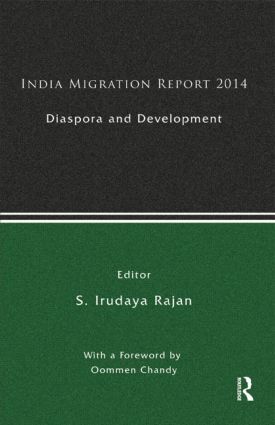 Return of Diasporas: India’s Growth Story vs Global Crisis S. Irudaya Rajan, V., Kurusu and Saramma Panicker C. K. 8. Punjabi Diaspora and Educational Development Kaveri Qureshi and Filippo Osella 9. Land, Migration and Identity: Changing Punjabi Transnationalism Steve Taylor 10. Diaspora and Remittances Milly Sil 11. Future Diasporas? International Student Migration from India to the UK S. Irudaya Rajan and Neha Wadhawan 12. Ethnic Indians in India’s Look East Policy Amit Singh 13. The Indian Diaspora in Oman Veronika Deffner 14. Indian Migrant Experiences in Oman and Bahrain Radhika Kanchana and S. Irudaya Rajan 15. Nitaqat — Second Wave of Saudization: Is it an Answer to the Domestic Discontent? Zakir Hussain 16. Kerala Emigration to Saudi Arabia: Prospects under the Nitaqat Law K. C. Zachariah, S. Irudaya Rajan and Jolin Joseph 17. Migration and Inequality Raju John 18. International Trade in Health Services: An Indian Experience Soumi Roy Chowdhury 19. Capability Quotient of the North-Eastern Out-Migrants Pinak Sarkar 20. Living Conditions of Sri Lankan Tamil Refugees in India C. Valatheeswaran. S. Irudaya Rajan is Chair Professor, Ministry of Overseas Indian Affairs Research Unit on International Migration at the Centre for Development Studies (CDS), Thiruvananthapuram.